Oatmeal choc chunk salted coffee caramel cookie! 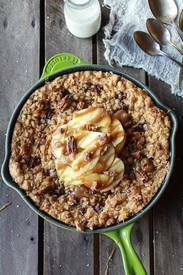 With apples, in a skillet!! Have you ever made a skillet cookie? Oh dear gosh, I really hope you have! Never made one before yesterday. I made this yesterday. I never show you guys stuff I made the day before, but this could not wait. I was just too excited about it. I gotta tell you a little about the coffee caramel. And really, I only have one thing to say. WOW. It’s good caramel sauce, really good!